It takes Rinka at least two hours to apply her thick white makeup and get dressed in an elaborate kimono on formal occasions, as is typical of most trainee geisha. But 29-year-old Rinka is different. She is a Chinese national hoping to take her place among the ranks of Japan's ancient but fading profession of female entertainers known for their beauty, skill at traditional arts and witty conversation. "When I first came to Japan, I had a neighbour who was a geisha. She played the shamisen (Japanese stringed instrument) daily and wore a traditional Japanese kimono," Rinka said in the port town of Shimoda, 200 km (120 miles) southwest of Tokyo. "It was really pretty so I, too, wanted to wear a kimono." She took a series of part-time jobs for years before finally taking advantage in September of a special one-year subsidized training programme offered by Shimoda city. 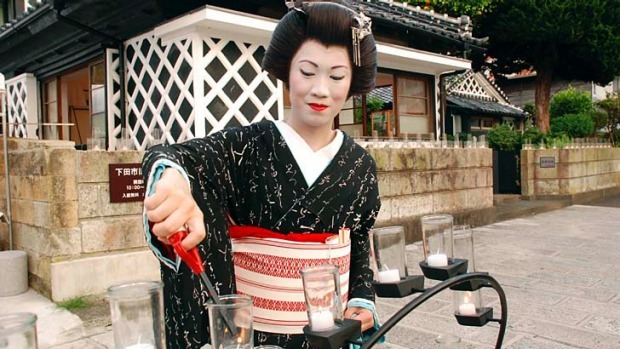 Shimoda is hoping that by paying to train geisha like Rinka, its tourism industry will get a boost. She receives 100,000 yen ($A1219) a month as a subsidy for her expenses, a programme that will end in September. The Kanoya kenban, which manages Rinka and other geisha, has only one or two customers a month, with fees starting from 19,000 yen ($A231) a performance. Even during peak year-end holiday seasons, the Kanoya gets fewer than 10 calls a month. Kanoya, the former geisha who runs the kenban, said she is impressed by Rinka's drive, despite the lack of prospects. "The practice of geisha arts uses a lot of terms from the traditional Kabuki theatre, which is hard to understand even for Japanese girls," she said. "In that, I think Rinka had to face even bigger challenges." "Now, I have to practise hard so in the future I can realise my dream of opening a fine Japanese inn in China to help Chinese people better understand Japanese tradition," she said. "I want to try out things I have never attempted before. I'm young enough for that."